So if you haven't noticed, there is a massive trend in our industry to become an educator. And while I am a big believer in this trend, I also believe in making sure that as creatives, we do it in the right way. I want to help you add education without it confusing your audience or being a big distraction from the incredible work that you already do! The last thing we should be doing is adding something extra to our plate that overwhelms us or just makes things messy. So, we are going to walk through step by step exactly how we should be approaching education and how we can add it to our brand in a way that is cohesive and really just helps us serve in a bigger way. 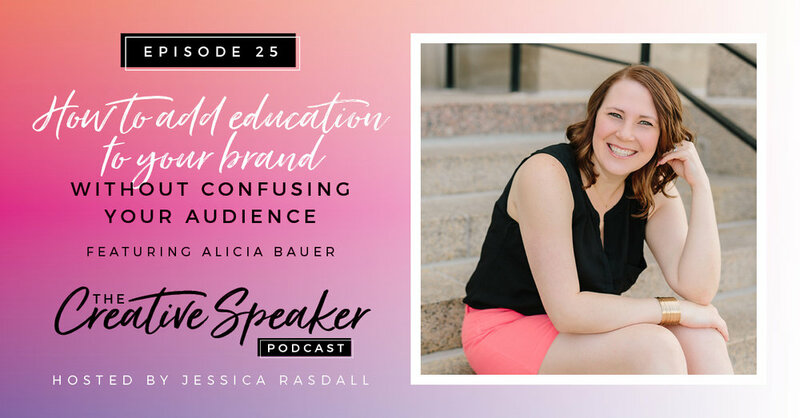 My good friend, Alicia Bauer, has A TON of experience with this topic and in this episode she is going to share her wealth of wisdom with us. She helps creatives figure out how to add their real selves to everything they build into their brand, including educational elements. And she is REALLY good at it! Before you add education to your brand, really know who you are and what your brand stands for. Be confident in that and listen to yourself before you just follow the trend. Becoming an educator can truly take form in the style you choose. Not everyone’s education elements will look the same - It is not a cookie-cutter thing! Following along and learning from the wisdom of others is crucial, but it is so important to learn their principles and add your creativity, your personality, your style, and truly be authentic in what you are doing. It is important that you bring your audience on the journey of adding education to your brand. It will keep them engaged and excited for what is to come!